In this next installment of Horsepower Roadblocks, we find ourselves back to the good old reliable powerhouse of the light-duty truck market commonly referred to as the 12-valve. The 12-valve is the first generation of the 5.9L Cummins inline 6-cylinder. The 5.9L is part of the “B” series of engines designed and built by Cummins. The B series has a displacement of almost one liter per cylinder. The engine came in two configurations, a 5.9L inline 6-cylinder and a 3.9L inline 4-cylinder. The B series engines have found their way into a wide range of applications including buses, construction equipment, boats, generators, military vehicles, commercial trucks and light-duty trucks. Its first commercial use was in 1984 as an agricultural engine. These engines were designed to be extremely reliable with very little maintenance. Some of the key features in these engines are gear-driven cams, mechanical injection, mechanical lift pumps, overly stout rods and the block is a deep skirted block. As you may have guessed, the “12-valve” refers to the number of valves the head has. Later (mid-year 1998) these engines received numerous updates and the new slang for these engines was “24-valve.” Again, that is because there were four valves per cylinder for a total of 24. The 12-valve Cummins originally hit the light-duty truck market in 1989 with 160 horsepower and 400 ft/lbs of torque. The engine used a Bosch VE rotary injection pump to feed the pop-off injectors. Four years later (in 1994) the second generation of the 12-valve was introduced. This engine was rated at 160 horsepower and 400 ft/lbs of torque for an automatic and 175 horsepower and 425 ft/lbs of torque for a manual. These engines saw a new inline piston-driven pump. The new piston-driven pump (commonly called a p-pump) was still a Bosch pump model P7100. This p-pump has become one of the most popular injection pumps to be modified in the aftermarket. It wasn’t too long before people realized that by simply adjusting a screw and moving a plate, they could “turn up the pump” and increase the power of their engines. By 1998, just before the 12-valve engines were replaced with the 24-valves, the factory was rating the automatic at 180 horsepower and 420 ft/lbs of torque, while the manual transmission trucks were rated at 215 horsepower and 440 ft/lbs of torque. But as we have seen over the years, this was not even a scratch on the surface of what these engines could do. Even though this engine hasn’t been produced in years, it still remains a very popular engine to modify. Since the diesel horsepower wars hadn’t started yet, the early 12-valve engines needed quite a few modifications to start showing their potential. The 12-valve engines that came with the VE injection pumps (1989 to 1993) require more money and effort to reach the 500 horsepower mark and beyond. Most agree that these engines should be updated with the Bosch P7100 p-pumps. It doesn’t seem to really matter which pump you choose (the pumps were rated at different horsepower depending on the trucks OE horsepower rating) for the 500 horsepower goal. Once the p-pump conversion has been completed, changing the camplate to a number 10 or a custom 100 is a good place to start. The number of the camplate represents the factory horsepower rating. The higher the camplate number, the lower the horsepower rating (with the exception being custom plates). Next, the delivery valves in the pump will need to be upgraded. “I like my Taper Cuts for street use, as it fuels like a set of 191’s but without all the bottom-end smoke,” says Mark Wilson, sales and technical manager for PDR Diesel Performance. 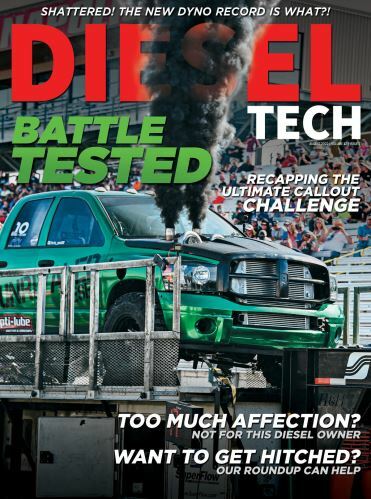 “For competition use, I recommend full cuts,” Wilson continues, “They will flow the most fuel but are not recommended for street use.” Feeding the injectors more fuel only works if the injectors can flow more. So upgrading to 370’s will work if you don’t mind being a little smoky. Otherwise, a custom set of injectors with honed or EDM (Electrical Discharge Machining) tips will do a much better job of delivering the horsepower while maintaining a relatively clean burn. Increasing the RPMs of the engine will also help free up some horsepower. A three or four thousand RPM governor spring kit will do just that. For good useable power above 400 horsepower, our expert panel recommends using a set of twin turbochargers. The high pressure turbo (the small turbo) can be a HX35 (stock turbocharger on the second generation 12-valves) with a low pressure (the large turbo) using a compressor wheel around a 72 to 76 mm. This combination is very streetable and has manageable EGTs, while still being able to tow and use the truck, well, as a truck. Once you have the air and fuel, it is time to address the engine itself. Head studs are strongly recommended at this power level and a good idea anytime you are going into the engine. There was some differences between fire ringing (o-ring) the head or not, but most say this is a good power level to think about adding it to. Adding a good efficient cam will yield better fuel efficiency and more power. When modifying the cam and turbo, it is always a good idea to upgrade your entire valve train to help everything run properly. “Anytime you are dealing with boost levels above 30 psi, the valve springs start losing their effectiveness and the valves start to unseat,” says Zack Hamilton from Hamilton Diesel Cams. “This can cause catastrophic problems and eventually cause engine failure,” Hamilton continues. In addition to upgrading the cam, adding a cam retainer and crank gear retainers are also recommended at this power level. For anything higher, they are needed as the increased stress from the higher performing injection pumps tends to walk the gears off. The difference between 500 and 750 is only a matter of air and fuel. Pretty easy, right? Well, we wish it was. The fuel part of the equation is quite challenging unless you have someone like PDR around who can build a custom injection pump. The 180 horsepower and 215 horsepower p-pumps are the best injection pumps to work with here. The pump will need to be torn down and “tweaked” with higher timing and the pump will need to be balanced on a bench test stand by someone who knows what they are doing. A custom camplate is recommended and EDM’d or extrude honed delivery valve holders are required to maintain 750 horsepower reliable. At this horsepower level, oversized injection lines should also be used to help flow the increased fuel to the injectors. While 370cc injectors have been able to make this horsepower, a custom set of injectors is the best option. These will be built to flow the exact amount of fuel for your desired horsepower level and engine modifications. Matching components at this level will make the difference between reliable, efficient horsepower and smoky, unreliable horsepower. Now that the fuel injectors have been upgraded and the injection pump flows more, the stock mechanical lift pump will need some help. An external electric lift pump that can flow a constant 25psi of fuel pressure to the injection pump at all times is the best option for reliability. The internal modifications that were made for 500 horsepower will work for this level as well with the addition of a block girdle and fire rings. The turbochargers will need to be larger. A good set of twin turbos will pride the necessary air flow needed for street use. The compound turbo setup will use a compressor wheel of 62mm for the high pressure and somewhere around a 72 to 76 mm compressor for the low pressure. While the compressor wheels are around the same size as the 500 horsepower, the turbine housings and turbine wheels will be different. At this power level, “a good high-pressure water injection system should be used,” says Joe Hellmann of Hellmann Performance. “By high pressure, I’m talking about 500 psi and higher,” Hellmann continues. High pressure water injections systems allow for small incremental adjustments to fine-tune the power level and EGTs. Driving 1000 horsepower with just a push of a pedal is a little difficult for street use. Now, we’re not saying it can’t be done, I’m sure one or two of our readers are currently doing it (let us know), but most will opt for a little extra nitrous instead. Now that you have the fuel, it is time to address the air. A thousand horsepower requires quite a lot of air and twins are really the only way to go outside of a dedicated competition vehicle. The small high pressure turbocharger should use a compressor wheel around 66/67 mm and the larger low pressure turbocharger will be around a 91mm compressor wheel. The engine will need to be torn down and the block will need to be surfaced. Installing 14mm head studs with a block girdle and retainers are a must. “I also fly cut the pistons and use a larger cam at this power level,” says Hellmann. When asked about how low, most say it depends on the individual truck and what it is going to be used for. These engines will also need to be better taken care of and using premium synthetic oils like Royal Purple will help preserve the internals. Oil changes will need to be done much more frequently and fuel economy should not be of concern if 1,000 horsepower is what you want. The life of the engine itself goes down and the engine will need to be torn down and rebuilt much more frequently.